In India, the construction industry engages approximately 4 million workers and contributed 8% of Indian GDP during the financial year of 2012-13. The sector showed a growth rate of 5.9% during 2012-13 against growth of 5.6% in the previous year. As per the latest estimates, there are around 500,000 construction workers in Gujarat; 50,000 of which are based in Ahmedabad city. Construction workers are a group that are particularly vulnerable to health risks because they have few legal protections, a poor safety net, increased exposures to some environmental factors, and are economically disadvantaged. The work involved in the construction industry is mostly temporary; most workers receive daily wages in cash and have neither contractual obligations nor benefits. Construction work involves manual lifting and carrying and may lead to musculoskeletal injuries. Working at heights, with heavy overhead loads, operating heavy machinery and power tools or working under temperature extremes contribute to risk of accidents and injuries. India has the world's highest accident rate among construction workers, i.e., 165 out of every 1000 workers., Merlino et al. concluded that musculoskeletal symptoms are a significant problem among young construction workers even at the beginning of their careers. Furthermore, the majority of workers are migrants from other state, and as a result families are typically highly mobile without developed local support networks. The effects extend beyond the workers themselves as both parents may be engaged in construction, and older girls are often forced to drop out of school to care for their younger siblings. In addition to occupational health hazards and socioeconomic stresses, hot environments also pose health risks. Urban heat island effect and changing climate contribute to increasing heat exposure for city-dwellers and outdoor workers in particular., The Government of India and state governments have framed acts and regulations for improving working conditions for construction workers. However, due to the rapid growth of infrastructure, neglect of safety and health aspects of construction work continues. In India, there is little research documenting the aspects of thermal load and health outcomes among construction workers. A study in Ahmedabad on other occupations showed that workers' perceptions of heat load and reports of heat related disorders were significant and correlate with the physical findings at the workplace. The same study concluded that occupational groups exposed to direct solar radiation have increased risk of heat injury. In addition, extreme temperatures in Ahmedabad have been documented to have health effects on the general population. Slum dwellers and infant health and overall population mortality have all been shown to be impacted by heat in Ahmedabad – particularly in relation to the 2010 heat wave in Ahmedabad.,, The aim of the present study is to characterise the effects of heat on construction workers from a site in Gandhinagar, Gujarat – adjacent the city of Ahmedabad. This study consisted of a cross sectional survey, focus groups discussions (FGDs), and environmental measurements of heat stress exposure in workplace settings. The study population included construction workers in the city of Gandhinagar, Gujarat, India located in the western part of India which is an extremely hot region. Data was collected in two seasons i.e., summer and winter months. Summer surveys were carried out in May of 2013 and 2014 (43 + 66) and winter surveys in January of 2014 (110) for a total of 219 participants. FGDs occurred in May of 2013 and 2014. The survey and FGDs were conducted between 9AM and 6PM (working hours). Unskilled workers, both males and females, over 18 years of age who consented to participate in the study were included. Management staff and those engaged in office work were excluded from the study since they spent most of their time indoors or spent minimal time performing strenuous activity. Ethical clearance for this study was obtained from the Institutional Ethics Committee (IEC) of the Indian Institute of Public Health Gandhinagar. The survey consisted of an interviewer administered structured questionnaire, adapted from the HOTHAPS study  and piloted locally before being administered. All subjects were engaged in construction work at the site. All subjects were asked questions covering age, body habitus, socio-demographic information, nature of work performed, lifestyle choices, history of illness, individual preventive measures and heat related symptoms experienced during work. The participants were also questioned whether they had any of the specific symptoms from a predetermined list, classifying the severity from 1 (None) to 5 (Severe). All data was analyzed using SPSS version 20.0 and Microsoft Excel 2013. While the location of the study remained the same in both summer and winter months, repeating the survey with the same workers was not feasible due to the high turnover rate of labourers in the construction industry. Data was collected through four FGDs with 11 participants each. The purpose of this qualitative component of the study was to understand the perception of construction workers regarding their work in a hot environment and to understand their knowledge of available health protective resources. The FGDs were carried out at the workplace during the afternoon hottest portion of the day to best capture participants' perception of heat stress. All FGDs were conducted in the local language (Gujarati) and Hindi with the help of a facilitator and a field note taker. FGDs were thematically coded into concepts and categories using grounded theory approach. The workplace heat exposure parameters include Ambient Dry Bulb Temperature, Wet Bulb Temperature, and Globe Temperature measured by a Wet Bulb Globe Temperature (WBGT) Monitor (QUESTemp 34, Heat Stress Monitor, United States) and temperature/humidity data-loggers (Lascar EL-USB-2-LCD, United States) collected from 10AM to 4PM. Environmental thermal characteristics were expressed in terms of the WBGT index. The measurements were automatically recorded at one minute intervals and the instruments were kept in an open space. The self-reported characteristics of male and female construction workers are in [Table 1]. On average, the workers have similar stature and most labourers were between 18 and 35 years. 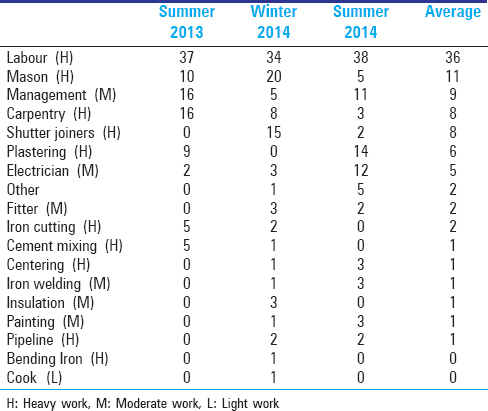 The average job experience of male and female workers during summer was 36.0 ± 70.5 and 42.0 ± 27.3 months and in winter was 36.0 ± 72.4 and 13.5 ± 15.6 months respectively. Most of the labourers work for 8-10 hours/day. The educational status of workers was found to be low i.e. only 10.75% of the workers had reached 12th standard and above. Nearly 58% of the workers didn't have any cooling measures like fans/air coolers available at home even during summer. Of the 84% of the workers who were migrants, 41% reported going back to their village to assist with agricultural tasks during harvest and cultivation seasons. Secondary occupations like farming, grocery shop keeping, and electronic repair were reported by 55.0% of summer workers and 41.8% winter workers. Workers were provided personal protective equipment like hats and shoes though none of the workers wore masks or gloves at work. Higher percentage of female workers were illiterate (67 vs 24%) compared to males, and fewer females reported access to household cooling measures such as fans (12 vs 41%). [Table 2] describes the differences in task assigned to labourers over the total sampling time. Labourers (unspecified), masons, carpenters, shutter joiners (form workers), plasterers, iron cutters, cement mixer, pipeline setters, iron benders were considered heavy work under ACGIH classification i.e., between 200-260 W/m 2. Moderate work, consisting of work between 130-200 W/m 2, on site was performed by electricians, fitters, insulation layers, painters and work managers. Only the cook fell into the light work category of 65-130 W/m., In this study that occurred at a single construction site, finishing jobs like electrical fitting and iron welding are concentrated towards the end of the construction process and study period (summer 2014). Overall reports of all heat related symptoms increased among workers surveyed in summer as hypothesized; 59% of labourers reported heat-related symptoms (Mild to Severe) as compared to 41% in winter with OR = 1.43 [1.54-1.32]. These results were calculated using the Wald method with continuity correction factor and were highly significant due to the large number of people sampled (P < 0.0000). 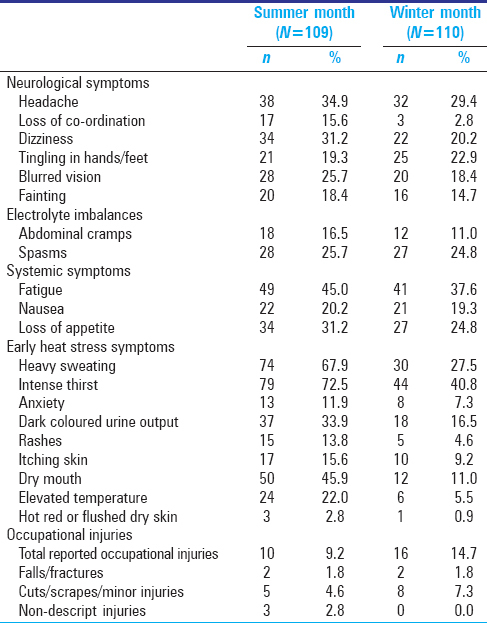 [Table 3] shows frequency of worker-reported symptoms and injuries. Over 40% of workers reported at least one symptom in either season. Heavy sweating (67.9%), intense thirst (72.5%) and dry mouth (45.9%), the latter two being consistent with dehydration, and neurological symptoms like headache (34.9%), loss of coordination (15.6%), dizziness (31.1%), blurred vision (25.7%) and fainting (18.3%) were more prevalent during the summer months compared to the winter. Nearly one fourth of the workers both in summer and winter reported spasms, 16.5% in summer and 10.9% in winter felt abdominal cramps and, 45% in summer and 37.3% in summer reported fatigue. Overall, 12.8% of workers reported on-site injuries during their work. These injuries ranked from minor cuts to a fracture, with a slightly - though not significantly - higher prevalence in winter (14.7 vs 9.2%) compared to summer. All injuries reported in summer were among workers with less than 36 months of experience. More experienced workers did not report injuries. The study also revealed that none of the workers were offered paid sick leave. Most of the workers reported that they did not seek treatment for minor injuries or health problems. As stated, in addition to evaluating the prevalence of heat-related symptoms, this study elicited reports of severity. [Figure 1] shows the difference in average reports n summer and winter for the workers graded by severity which indicate a clear shift in severity and frequency towards more severe and more frequent outcomes. The majority of symptoms are greater in summer. The FGDs explored socioeconomic status, health protective resources, workers' perception of exposure to hot environments, heat related disorders, and health measures adopted to cope with hot environment. FGDs occurred while workers took their one hour rest at lunch time (1PM to 2PM), generally in shade or under a tree as the rest area provided to the workers was insufficient and without any cooling facilities. The atmosphere during FGDs was cordial and workers seemed willing to discuss this topic. Four key categories were identified through the thematic coding: (1) Non-occupational stressors compound work stressors; (2) Impact of heat on health; (3) Awareness of heat-related preventive measures; (4) Resources available. Most workers and families are from rural areas of distant states like Bihar, Jharkhand, West Bengal, and Madhya Pradesh. Frequently cited drivers for migration included unemployment, less fertile land, family liabilities, and better life for their children. Both newly arrived workers and other workers noted the lack of availability of basic amenities, including housing, access to drinking water, affordable food, and proper sanitation. Workers described their job as strenuous and physically demanding. They spent most of the time outdoors exposed to direct solar radiation. The workers did not report injuries to supervisors as they perceived these injuries as part of their job or they feared negative consequences from the employer. Around a quarter of workers interviewed felt musculoskeletal pain. This finding is separate from reported symptoms of heat stress discussed earlier. Some workers perceived a trend of increasing numbers of hot days in summer over the past few years and an increased feeling of tiredness and exhaustion. Workers also affirmed that leave from work meant lost wages for ill workers, posing additional risk to their families. The health effects mentioned during FGDs included headache, heavy sweating, intense thirst, dizziness, weakness/fatigue, impaired judgment, nausea, loss of appetite, dark urine, blurred vision, spasm in leg/arm, fainting/unconsciousness, pink/red bumps and itching/prickly sensation. Some workers complained of lightheaded-ness in the evening and irritation and exhaustion. Workers reported the impacts of sun exposure on their eyes. They said that working in the sun caused eye strain that sometimes resulted in irritation. Workers reported adopting various strategies to prevent illness from heat such as drinking a large amount of water, sprinkling their face with water, resting in the shade. When asked what they did when they felt it too hot to work, most of the workers mentioned water as an important factor for coping in extremely hot climate. Some workers had noted a lack of safe drinking water available on site and stated that they supplied their own water from home to drink at work. The only personal protective equipment available to the workers were hard hats and safety shoes. These contributed to the workers feeling hot and sweaty. None of the workers were provided gloves and sun-glasses. Workers felt that the use of sun-glasses would protect their eyesight. Female workers complained that the toilet facility provided to them is unsanitary and unhygienic. The thermal environmental measurements were recorded continuously over the hottest parts of the work day. The results are tabulated below in [Table 4] and illustrated in [Figure 2]. In a comparison of summer and winter measurements, globe temperature shows the highest mean difference throughout the day; nearly constantly displaced with summer values about 1.5 times higher on average than winter values. All mean values of parameters are higher in summer while standard deviations increased during winter. Skews also tend to be more positive during summer while negative skews (between 0 and -1) are seen during winter. Winter data also shows a clear pattern of increase and decrease during the measurement period which is absent in summer. Our study observed that during summer the mean WBGT were above maximum ACGIH recommendation for WBGT i.e 32.2°C (25%:75% work rest ratio/hour) for light work. Even in winter the mean WBGT was 27.41°C i.e., 50%:50% Work rest ratio/hour according to established ACGIH threshold limit. All workers were observed to do continuous work during each season that fits the ACGIH classification of 75-100% work rest allocation. The corresponding threshold limit for this regime is 25.0°C which is exceeded by 7°C in summer and by 2°C in winter. Specific subgroups of workers such as migratory workers (due to lack of acclimatization and poor support network) and women (due to discrimination in the work place and inadequate sanitation facilities for women) have additional vulnerability factors that could put them at increased risk of heat-related illness. The mean recorded WBGT in summer was 32.4 ± 1.1°C which is 3.4°C higher than suggested permissible exposure limits for acclimatized men in the tropics., Wider temperature variation during the workday is seen in winter whereas summer shows a mostly stable ascending trend. While mean wet bulb temperature remains constant in both seasons, the variance and skew alter significantly. This indicates that winter days offer a greater respite from humid heat in the early hours when compared to the summer even though at peak temperatures, they may even exceed those of summer. However which proportion of the differences are attributable to which temperature variable will require a more detailed study. In summer, all workers work at conditions above the recommended values adjusted for work intensity and work/rest ratios. Even in winter, those performing heavy labour are working at conditions above those prescribed by the ACGIH. Broadly, from environmental heat metrics and labourer reported symptoms, the study shows a heat-stress related health effects throughout the year and increased in the summer. We surmise that the high exposure coupled with strenuous physical load are the major contributing factors. The majority of symptoms with significantly higher odds in the summer were all classic symptoms of severe dehydration and heat exhaustion bordering on heat stroke. Excessive sweating, which showed the most significant increase, would have compounded the effects of those disorders. Also of note is that this study may be conservative in its findings as responses related to heat disorders among construction workers may be higher than those figures observed in the study due to a healthy worker bias (i.e., those most affected by the heat were absent or had stopped doing this type of work). Another possible explanation may be attributed to the fear of being reprimanded by the management for discussing issues that may portray them negatively. Our findings showed that break rooms provided to the workers were inadequate for their needs and ineffective in reducing the thermal load of participants. The focus group discussion findings also supported that heat illness and discomfort were attributed to their level of heat exposure. The best way to prevent heat stress, ideally, is to avoid heavy manual work in a hot environment. Other methods may include the use of mechanical means or the work to be completed it in cooler parts of the day. Inaba and Mirbod  observed that an onsite air conditioned break room and ice should be available during the working hours in the summer to aid recovery in exposed workers. To address these concerns, supervisors/contractors should suggest job rotation, the provision of cold water onsite, an earlier start to the day or extended work in the evening with frequent breaks and training on heat preventive measures to the workers. Engineering controls like erected shelters, fans, water fountains and proper restrooms can reduce heat stress among workers. Pascoe et al. recommended that overall, to keep cool in the heat a worker should wear: (1) Thin clothing that allows evaporation; (2) clothing that blocks radiant heat; (3) loose clothing that allows air to circulate next to the skin; (4) materials that keep excess moisture from lying on the skin surface. The study recorded an array of heat illness indicators among construction workers. There is lack of Indian heat exposure guidelines for determining ceiling limits of environmental exposure for tropical heat exposure of the population. Our study supports the establishment of separate tropical or India specific heat exposure guidelines and interventions that could simultaneously be worker protective but realistic in this climate. WBGT may not be the best indicator for Indian conditions as all measurements in summer, and winter, were well above the recommended exposure limits as defined by the ACGIH guidelines. However, work was possible on these days and most workers are acclimatized to these otherwise extreme conditions. 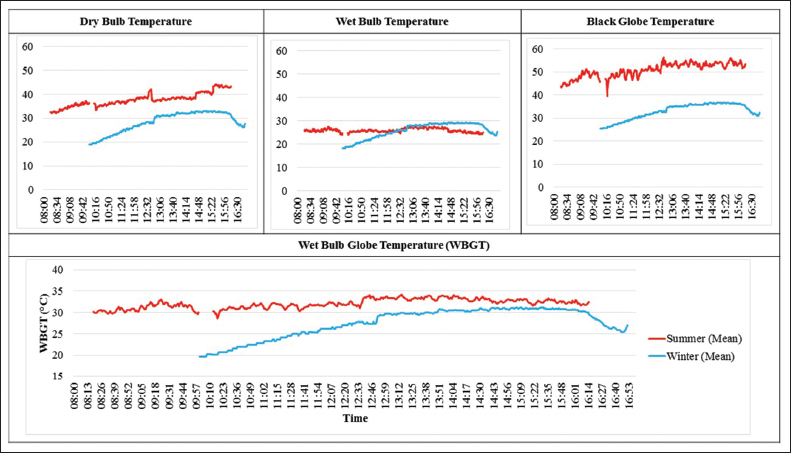 WBGT is highly dependent on wet bulb temperature as a component of its calculation. 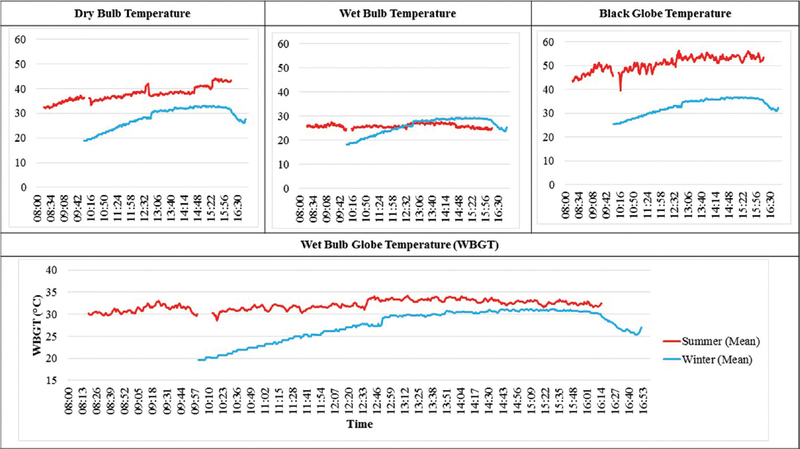 Mean wet bulb temperature does not vary between summer and winter and the majority of change between the heat stress indices (i.e., globe temperature and dry bulb temperature) only accounts for 30% of the total calculation of WBGT. While the location of this cross sectional study was the same in summer and winter months, the specific workers and worker tasks differed between the survey times. However, regardless of possible differences between the summer and winter survey participants and their activities, heat-related symptoms and environmental measurements of heat stress were high in both seasons supporting our overall finding that heat stress is an important risk factor for worker health. A key strength of this study is that the research team is part of a larger on-going effort of the Ahmedabad Heat and Climate Study group with local public health, municipal, and international academic partners. This group is supporting efforts by the city to create a larger heat action plan  and thus findings from studies like these have an immediate conduit for translation into public health protective interventions. A key objective of this study was to identify possible intervention points at both worker and policy levels. As workers who participated in our study already seem attuned to heat risks, emphasis needs to be on creating a culture of health at the work sites through empowering the workers, incentivizing the employers, and enforcing existing safety regulations. Interventions as seemingly unrelated as supporting migratory workers' rights or providing appropriate toileting facilities for women might indirectly help lower heat-related illness. Heat stress could potentially be impeding productivity and contributing to worksite accidents, and given that India already has the highest accident rate for construction workers, both private and public sectors have a vested interest in intervening around the issue of heat stress and construction sites. Further studies on construction work may be advantageous in estimating the exact nature of thermal load experienced by workers and its discernible effects. Such work may go a long way in understanding India's burden of heat stress illness, both occupational and otherwise. The study highlights that the construction workers have a high burden of heat related discomfort and illness, particularly during summer months. Rapid growth, increasing urbanization, and frequent high heat episodes in Gujarat and Western India make the construction sector extremely vulnerable. This population should be a key focus of heat illness prevention activities, and continued cooperative efforts between the public and private sectors to protect the health of these essential workers should be encouraged. Dr. Dileep Andhare (IIPH-G), Dr. Jeremy Hess (Emory University), Anjali Jaiswal (NRDC), Dr. Kim Knowlton (NRDC and Mailman SPH, Columbia University), Dr. Dileep Mavalankar (IIPH-G) and Dr. Perry Sheffield (Icahn SOM at Mount Sinai). Ministry of Finance, Quarterly Review 2013-14 (April-June). Government of India, Department Of Economic Affairs, Economic Division, 2013. Bose A. Census of India 2011: Some Highlights. New Delhi: Yojana; 2011. p. 5-9. Official Home Page of International Labour Organisation 2011. Available from: http://www.ilo.org. [Last accessed on 2011 Dec 16]. Bharara K, Sandhu P, Sidhu M. Issues of occupational health and injuries among unskilled female labourers in construction industry: A scenario of Punjab State. Stud Home Com Sci 2012;6:1-6. Merlino LA, Rosecrance JC, Anton D, Cook TM. Symptoms of musculoskeletal disorders among apprentice construction workers. Appl Occup Environ Hyg 2003;18:57-64. Shah KR, Tiwari RR. Occupational skin problem in construction workers. Indian J Dermatol 2010;55:349-51. Devi K, Kiran UV. Status of female workers in construction industry in India: A review. IOSR J Humanit Soc Sci 2013;14:27-30. Christensen J, Hewitson B, Busuioc A, Chen A, Gao X, Held I, et al. Regional Climate Projections. Climate Change 2007: The Physical Science Basis. Contribution of Working Group I to the 4th Assessment Report of the Intergovernmental Panel on Climate Change. Cambridge, UK. New York, NY, USA: Cambridge University Press; 2007. Mohan M, Kandya A. Impact of urbanization and land-use/land-cover change on diurnal temperature range: A case study of tropical urban airshed of India using remote sensing data. Sci Total Environ 2015;506-507:453-65. Sawacha E, Naoum S, Fong D. Factors affecting safety performance on construction sites. Int J Proj Manage 1999;17:309-15. Nag P, Dutta P, Nag A. Critical body temperature profile as indicator of heat stress vulnerability. Ind Health 2013;51:113-22. Azhar SG, Mavalankar D, Nori-Sarma A, Rajiva A, Dutta P, Jaiswal A, et al. Heat-related mortality in India: Excess All-cause mortality associated with the 2010 Ahmedabad Heat Wave. PloS One 2014;9:e91831. Kakkad K, Barzaga ML, Wallenstein S, Azhar GS, Sheffield PE. Neonates in Ahmedabad, India, during the 2010 heat wave: A climate change adaptation study. J Environ Public Health 2014;2014:946875. Tran KV, Azhar GS, Nair R, Knowlton K, Jaiswal A, Sheffield P, et al. A cross-sectional, randomized cluster sample survey of household vulnerability to extreme heat among slum dwellers in Ahmedabad, India. Int J Environ Res Public Health 2013;10:2515-43. Kjellstrom T, Gabrysch S, Lemke B, Dear K. The 'Hothaps' programme for assessing climate change impacts on occupational health and productivity: An invitation to carry out field studies. Global Health Action 2009;2. Liljegren JC, Carhart RA, Lawday P, Tschopp S, Sharp R. Modeling the wet bulb globe temperature using standard meteorological measurements. J Occup Environ Hyg 2008;5:645-55. ACGIH. 2013 TLVs ® and BEIs ® - Based on the Documentation of the Threshold Limit Values for Chemical Substances and Physical Agents and Biological Exposure Indices. Cincinnati: American Conference of Governmental Industrial Hygienists; 2013. ISO. ISO Standard 7243. Hot Environments-Estimation of the Heat Stress on Working Man, Based on the WBGT-Index (Wet Bulb Globe Temperature). Geneva: International Standards Organization; 1989. Pascoe DD, Bellingar TA, McCluskey BS. Clothing and exercise. II. Influence of clothing during exercise/work in environmental extremes. Sports Med 1994;18:94-108. Knowlton K, Kulkarni SP, Azhar GS, Mavalankar D, Jaiswal A, Connolly M, et al. Ahmedabad Heat and Climate Study Group. Development and implementation of South Asia's first heat-health action plan in Ahmedabad (Gujarat, India). Int J Environ Res Public Health 2014;11:3473-92. Kjellstrom T. Climate Change Exposures, Chronic Diseases and Mental Health in Urban Populations - A Threat to Health Security, Particularly for the Poor and Disadvantaged. Technical Report to the WHO Kobe Centre. Kobe, Japan: World Health Organization; 2009.